Opis: Municipal History of Essex County in Massachusetts, Vol. 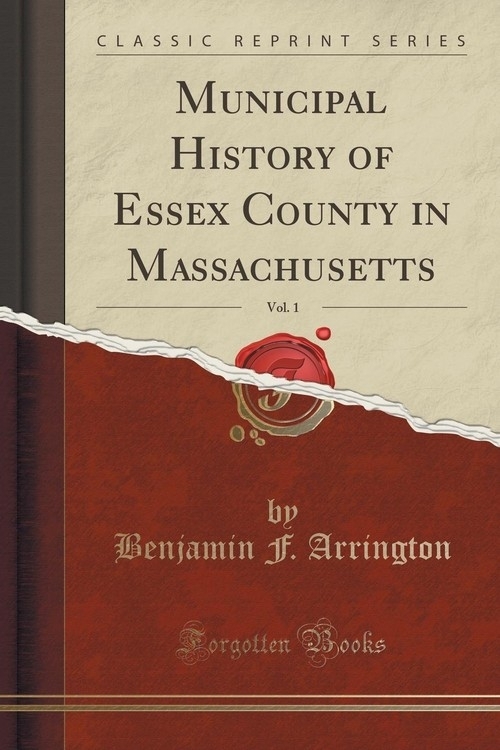 1 (Classic Reprint) - Arrington Benjamin F.
More than three decades have elapsed since a history of Essex County was presented to the public. The animating purpose in the present work has been two-fold: First, that while provision be made for preservation of the essentials of a recorded past, sundry classifications (second) should also distinguish the activities that attend community growth as well as industrial and commercial expansion. To this end, various subjects have been taken up for individual treatment by writers qualified alike by local association and familiarity with fundamentals to deal befitting with the matters thus assigned. And this leads to the observation, pertinent both to the moment and mention, that the list of these contributors does not, in all cases, correspond to the enumeration set forth in local preliminary prospectuses. By reason of illness, unexpected pressure of business, or other causes that need not be expressed, some of the listed contributors felt compelled to retire. In a few instances, such were the respective competencies of these gentlemen that the original engagements were held open, at embarrassment from the publishers' standpoint, until the printers were set at work. Then, when the fact became apparent that extension of time could not be rewarded with the promised papers, the common procedure followed, whereby experienced staff writers supplied the need. While it would have been highly desirable to deal at length with the roster of men from Essex County communities who served in the late World War, in whatever capacity, the fact became manifest at an early stage that anything like adequate enrollment was entirely out of question. County, State and Federal records are yet in an incomplete form. Time, care and patience are among the essentials of such a record as shall command full confidence. If any evidence were needed to demonstrate the imperativeness of awaiting more propitious conditions for the publication of such a record as is here indicated, that evidence could surely be found in Federal government listing of so-called "slackers," in which have appeared, unfortunate to add, the names of service men who either paid the supreme sacrifice on European battle fields, or else died from wounds or from disease contracted in the service. Here and there, to be sure, certain private local collections are reputed to be approximately complete. Even were these deemed competent for insertion in a history framed on lines which mark the present work, they are not available in every instance, primarily because of the intention on the part of their compilers to utilize them in a personal publication, later on. Szczegóły: Municipal History of Essex County in Massachusetts, Vol. 1 (Classic Reprint) - Arrington Benjamin F.
Recenzje: Municipal History of Essex County in Massachusetts, Vol. 1 (Classic Reprint) - Arrington Benjamin F.